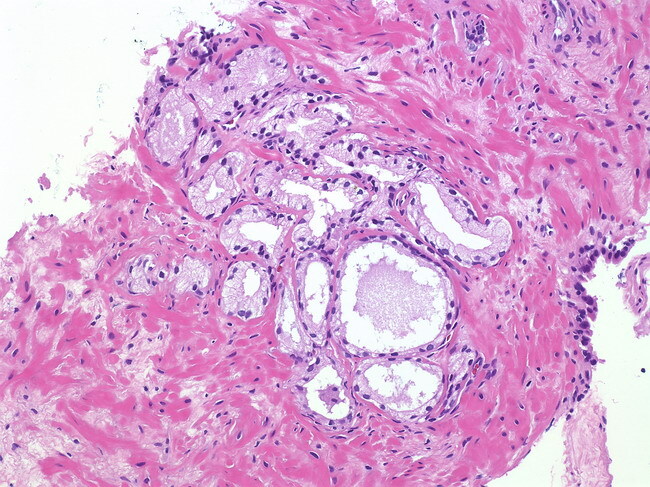 Partial atrophy is one of the most challenging mimics of prostate cancer. The focus shown here still retains lobular configuration. The glands are pale and lack the basophilic appearance typical of a fully developed focus of atrophy. Nuclear enlargement and prominent nucleoli are lacking. Immunostaining with high molecularl weight cytokeratin and p63 cocktail showed fragmented basal cell layer confirming the diagnosis.